One of my least favorite political chores is picking up and replacing damaged and lost lawn signs. 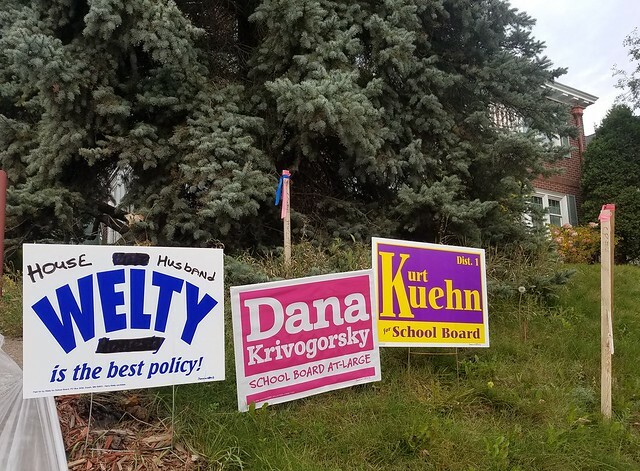 But at five bucks a pop and with a limited supply I knew I had to put some back up on 21st Ave east when I saw them badly abused along with their lawnsign partners, the Dana Krivogorsky signs. At the bottom of the hill I discovered that one midnight author had decided to amend my sign to, I guess, humiliate me. I am indebted to the anonymous vandal who thinks a man should not stoop to “woman’s work.” I’ve put it in my front yard and from now on will put any other signs of mine which are defaced right next to it. As for being a dreaded house husband, its true that baby boom boys were raised to be “bread winners” but a couple bad breaks put me in the position to test whether I could walk the talk. The “talk” was my 45-year conviction that women and men are equals. Being an equal meant valuing the work of women with the respect it deserved and not looking down on traditional roles. I was at home most of the time that our children grew up and they didn’t turn out so badly – a daughter with a masters in Education and a son a year away from completing a Chemistry/Physics doctorate at one of the nation’s top 20 universities in the field of science. Besides, had I not been a “house husband” I would never have begun the hobby that makes all Duluth smile every winter- snow sculpting. While I have not bragged about being a house husband I’ve not shied away from the label. The following admission is taken from a post last year. I owe a debt of gratitude to the anti-feminist ridicule bestowed on me. 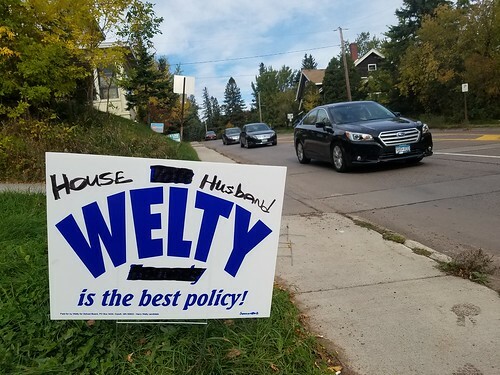 That sign will help me win a much larger share of the house husband vote and, with the shaky economy of recent years, its probably enough to assure my reelection. I’ve now relocated the sign to my front yard. 40,000 drivers and passengers who pass by will see it every day until the election on November 7th. Previous PostTrading teachers for new schoolsNext PostWrenshall!! !